Wanting to buy some top shelf, famous, fabulous perfumes, but worried that you can’t afford it? Are you longing for a bottle of perfume from Gucci, Giorgio Armani, Paco Rabanne or Prada? Then this is a perfect opportunity for you! Thanks to our The Fragrance Shop discount code, you can choose from some of the best fragrances in the world at lower prices than ever before! The shop was established in 1995 and was designed to be a privately owned family retailer of perfumes. The Fragrance Shops have easily accessible locations throughout the UK so that any customer can easily find one. For those who fancy staying at home, you also have the possibility to shop online at thefragranceshop.co.uk using a unique Fragrance Shop discount code! All the fragrances sold in The Fragrance Shop are top shelf, high quality products obtained from fragrance houses directly. There is no possibility of grey market products, copies or testers. The Fragrance Shop sells only the best fragrances from world wide known designers and brands. The perfumes available online in The Fragrance Shop are offered at the same price as the ones in-store, however you can easily save some money by buying online and using a The Fragrance Shop voucher! And it gets even better with orders over £40, as they are delivered for FREE! When in doubt while shopping online, you can easily contact customer advisers over the phone or by e-mail. So when you feel that you are not able to make up your mind about which perfumes suits you best, you can lean on professional advisers who will guide you through the entire shopping process. Additionally, for those who are interested in the fragrance business, there is a special Fragrance Shop blog where you can find news about latest perfume trends and much, much more! Remember to pick up your The Fragrance Shop promo code before finishing your online shopping to ensure you are getting the best price! The Fragrance Shop's motto is “Spray a little happiness”. But the need to share happiness goes beyond the shopping floor, but also influences the lives of children with serious illnesses. The Fragrance Shop partnered up with Rays of Sunshine, and thanks to this partnership, 5p from each purchase goes to those who need it the most. It currently brings in over £100,000 a year, and helps to fulfil the dreams of many children in dire need. Rays of Sunshine is a charity organisation whos aim is to allow seriously ill children to escape ,even for just a little while, from their difficult reality. The individual wishes of children, such as visiting Santa in Lapland or becoming a princess for one day, are catered for so that they can also experience memories in their lives that they will never forget. Browse through their fabulous, famous brands such as Armani, Hugo Boss, Burberry or Prada. Select the products that you like and add them to your bag. Remember to select the quantity. Choose the delivery option you wish to have, and then proceed to the checkout page. Now you can enter your e-mail address and your special Fragrance Shop discount code on the right side. Shopping online can be not only extremely easy, but also pleasurable thanks to our free Fragrance Shop voucher, so be sure to pick yours up today! If you are curious about the Fragrance Shop and want to learn some fascinating facts about how perfumes are made or what kinds of perfumes are best for you, then you should subscribe to their YouTube channel. If you do, there are many ways to find out about a new Fragrance Shop promo code that will allow you to buy your favourite perfumes at even lower prices! The Fragrance Shop is a place for every one. Their wide range of products offers numerous possibilities. But The Fragrance Shop is not only about perfumes! The product range there also includes Face Care,Body Care, Hair Care,Men's Care as well as Make up accessories. All of this and much more is within your reach, so don’t hesitate to shop online using The Fragrance Shop voucher or promo code! Thanks to couporando.co.uk you will have no problem to find valid coupons for Beauty & Health category. Apart from the newest Amazon UK codes there are lots of rabates which your can redeem at Fragrance Direct, Perfume Shopping or The Perfume Shop. The choice is immense! Browse for perfumes, creams, lipsticks, eye-liners or eye shadows. Select the quantity and choose the delivery option that is preferable for you. If you have everything you need in your bag, check out and then enter your special discount code. Continue shopping by entering your e-mail or starting an account. Choose your preferable way of payment. Wait for your confirmation e-mail! By now, you have already noticed that online shopping at The Fragrance Shop is extremely simple to do. But there is one thing that you have to remember! Pick up your unique Fragrance Shop voucher to get your purchase for lower price! 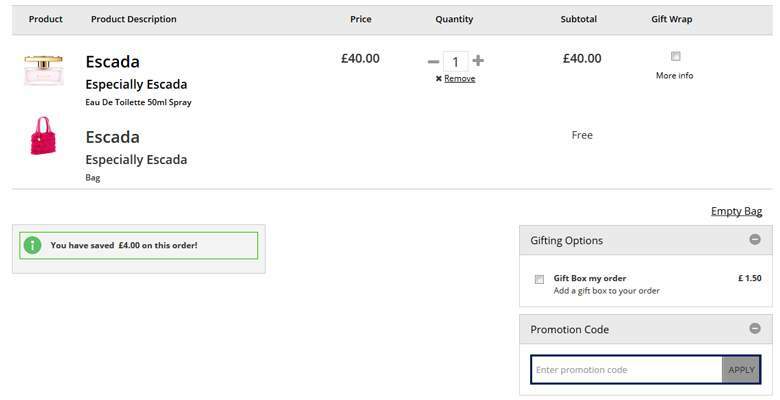 Remember that purchases over £40 are delivered free of charge. But you can save even more by picking up your personal Fragrance Shop voucher code! Be sure to check out The Fragrance Shop social media pages to find out even more about the company, and to stay up to date on new sales and promotions! Buy now online at www.thefragranceshop.co.uk. I like smelling good as much as the next person, which is why I often visit Thefragranceshop.co.uk. Here you can find all your favorite scents, along with plenty of ways to save by using a Fragrance Shop discount code. Using a The Fragrance Shop voucher is an easy way to reduce the price of your favorite scents, and they cost nothing to use. You can pick up a Fragrance Shop promotion code in seconds, so what are you waiting for? Grab your next favorite perfume at a discount price by redeeming your free The Fragrance Shop code today!